War has erupted across the Imperium! Up to four space faring races must struggle for control of the most prosperous systems in this micro-4X game from creator David J. Mortimer, Ludicreations, and Passport Game Studios. The 4X game category, for those who aren’t familiar, is a system in which players actions consist of four “Ex” actions, “Ex”pand, “Ex”plore, “Ex”terminate, and “Ex”ploit. Most 4X games consist of hundreds of components and take several hours to play through a game. Some examples are Eclipse and Twilight Imperium (no relation, aside from the 4X thing). Sometimes you want the strategy of a 4X game, but you just don’t have the time or table space. 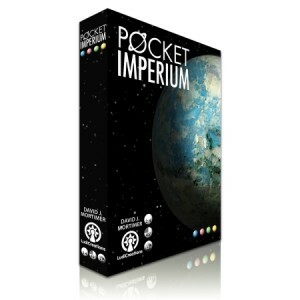 Pocket Imperium distills the system down to a game that takes just 45 minutes with 2-4 players, without sacrificing strategy, so you can get your 4X fix anytime and anyplace. I’ve been very busy of late. We move this week! The POD left last week. The trailer is getting packed up with the rest of it tonight. It is truly amazing how much stuff can fit into an 1800 sqft. house! My father-in-law is leaving tomorrow to tow the trailer to Federal Way for us! We follow on Thursday, and we will be in Federal Way on Saturday! I’m so excited! However, since my job isn’t quite done here, I’m coming back down to CA for a couple of weeks, but then I’m in WA permanently!